The latest edition of our Total Access magazine has been released this week and should be hitting inboxes and mailboxes any day now. 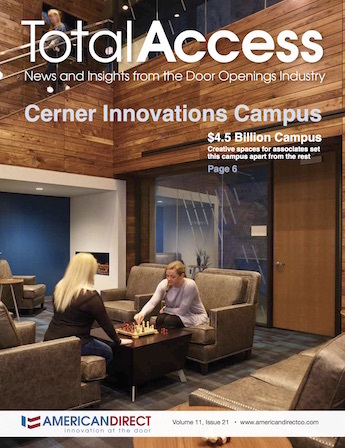 Total Access delivers news and insights from the door openings industry, including the latest on 8/28 projects, emerging trends, and valuable resources for general contractors, design teams, security professionals, end users, and commercial integrators. The Cerner Innovations Campus project profile looks at Cerner Corporation’s new $4.5 billion Innovations Campus, and how American Direct was a key player on the project team. Read more. Scott Lindley, veteran of the contactless card access control provider industry, writes a column about creating a healthcare provider access system. American Direct CEO and President, Byron Whetstone, gives insights in the Obvious Choice feature on the challenges and opportunities presented by the convergence of Divisions 8 and 28. He connects the dots as to why American Direct has transformed to be the first company in the industry to combine Division 8 and Division 28 product, service, and expertise to provide totally integrated safety and security solutions at the door opening. Read more. A feature on AccessNsite, American Direct’s total access control solution, spelling out how AccessNsite goes beyond access control to provide smart, simple, and seamless security solutions. Read more. The project profile on Sunset Primary School showcases how this new school is lockdown ready by using the BEST SHELTER system keeping students and teachers safe and secure in the classroom. Read more.